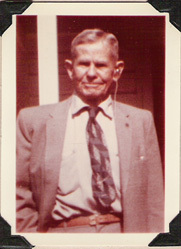 James Verner Marvin Claybourn (“Vern”) was born 1 January 1882, at Woodlawn, Illinois (Jefferson County) as the third child and oldest son of Reuben and Mary Ann Claybourn. He graduated from Kinmundy (Illinois) High School in 1900 and served as president of his class. He won a scholarship by “county central examination” and passed for a teacher’s certificate. Later Vern finished a correspondence course in mechanical engineering, became a licensed engineer and later a master of dredges. In 1905 when the best sub-aqueous excavation men were called to build the Panama Canal, Uncle Doc’s superior, F.B. Maltby, was called to Panama, and among the first men he sent for was Uncle Doc. Maltby’s successor as superintendent at Memphis, William Gerig, put Vern in his office after he took a competitive examination. 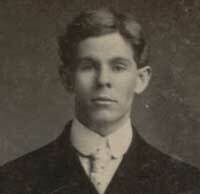 When Gerig later went to Panama, he cabled for Vern in 1907. After several years of office work, Vern asked for mechanical work and worked on cranes, cableway machines, and on lock construction. Later he worked on dredges until he resigned in 1922. Vern was Secretary of the Gatun Cableway Club and for five years served as Secretary of the International Brotherhood of Steam Shovel and Dredge Men. He was Keeper of Records and Seal, Master of Finance, and Chancellor Commander of the Knights of Pythias. He was active in the Y.M.C.A., Red Cross, the Liberty Loan committees, and the Canal Baseball League. He was also a member of the “Society of the Charges,” receiving a Roosevelt medal with two bars. The U.S.S. 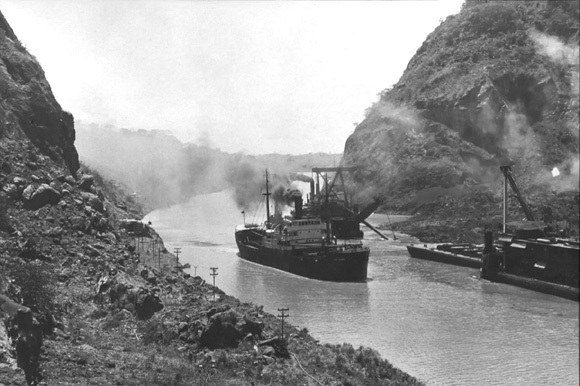 Ancon passing through the canal on 15 August 1914, just as the First World War was erupting in Europe. Vern received a card signed by Gov. George W. Goethals (first Civil Governor of the canal zone) permitting him to ride on the first commercial ship that went through the canal, the U.S.S. Ancon, on 15 August 1941. During his years on the Canal Zone, Vern and his family returned to the United States for vacation six times, but he and Pearl feared that their children were losing something by not having a permanent United States environment. Therefore, in 1916, Vern bought a house at North 4th Street in Mt. Vernon, Illinois, thinking he might return there to live. However, he decided on California as more agreeable after living in the tropics. Settling in Montebello, California, he was active in civic affairs, engaged in building construction and had other business interests. During World War II, his experience on the Canal was called into use. He served as Mechanical Superintendent of the U.S. Engineers Machine Shops in Honolulu and as inspector on the cantonment construction in Santa Maria, which was later the Vandenburg Base. Vern later constructed his own home in Whittier, California, where he and Pearl lived near some of their children and grandchildren, at 8521 South California Street. They were members of the First Methodist Church in Whittier and Vern was a member of the Panama Canal Club in Los Angeles. Vern became interested in the family history and at least as early as 1906 he began collecting data and corresponding with James Harrison Claybourn, forming the foundation for the information making up the Claybourn Genealogical Society. Without Verner this website would never have been made. Vern died on 29 December 1962 in Los Angeles. His wife Pearl lived on to the ripe old age of 95, passing away on 16 September 1980. Both of them are buried in Rose Hills Memorial Parker Cemetery in Whittier, California. 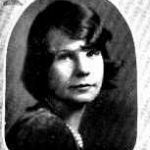 Mary Adelais Claybourn was born 28 December 1905, in Memphis, Tennessee. She graduated from Montebello High School and was nicknamed “A”. She married on 27 October 1923 to Herbert Edward Allred and together they had one daughter, listed below. [Herbert Allred was born 21 October 1904.] Herbert’s 2nd great-grandfather is John Allred, who was born in 1772 and died in 1850 in Newton County, Arkansas. This John Allred is also the 5th great-grandfather (on his maternal grandmother’s side) of Barack Obama, the 44th president of the United States. Herbert worked for General Petroleum Co. in Los Angeles and Sacony-Vacuum Co. in Egypt and Venezuela (both Standard Oil). He retired in 1958 after thirty-seven years with them. Herbert died on 2 March 1962 in Corpus Christi, Texas, and is buried there in Seaside Memorial Park Cemetery. Mary followed on 22 February 1966 in Dallas, Texas, and is buried there in Hillcrest Memorial Park Cemetery. Shirley Patricia Allred was born on 17 July 1929 in Whittier, California. She graduated from Whittier High School and spent two years at Fullerton Junior College. She married on 4 October 1949 to Donald Chase at Tigrita, Venezuela. [Donald Chase was born on 9 September 1926.] Donald was from San Antonio, Texas. The couple had four children and made their primary residence in Corpus Christi, Texas (and later Van, Texas). Richard Edward Chase was born on 17 August 1951 in Venezuala but died just a day later. Michael Edward Chase was born on 24 January 1953. He graduated from Sam Houston State University in 1984. He worked as a senior software developer in Houston, Texas. Michael married Kathryn Anne Patterson. They had daughter Meagan Anne Chase in 1986 and son Michael Josiah Chase in 1988. Darrell Lee Chase worked as the head golf professional at Peach Tree Golf Club in Bullard, Texas. He married Lori Palmer on 24 May 1980 in Travis County, Texas. They had daughter Mercedes Anne Chase in 1981, son Christopher Ryan Chase (born on 9 February 1984 and died the next day), and son Matthew Donald Chase in 1985. Robert Allred Chase was born on 30 September 1960 and lived in Van, Texas. He married Rosalinda Luna on 30 December 1989 in Potter County, Texas. They had two daughters, Victoria Ariana Chase in 1991 and Samantha Nichole Chase in 1997. Ethel Catherine Claybourn was born on 17 March 1907 in Memphis, Tennessee. She graduated from Montebello High School and was nicknamed “Pink” because of her red hair. She primarily worked as a telephone operator. Ethel married on 1 September 1925 to Paul Victor Ritter and together they had at least one child. [Paul Ritter was born on 26 August 1905 in Kansas City, Missouri.] The pair lived in East Los Angeles with Paul working as a butcher and had done cross country trucking. Ethel died on 5 August 1966 and Paul died years later on 24 December 1991, both in Los Angeles, California. They are buried in Rose Hills Memorial Park Cemetery. Paul Victor Ritter, Jr. was born 28 Sept. 1930 in Los Angeles. He graduated from El Monte High School and spent one year at Mt. San Antonio College in Walnut, California in 1945. He was in the Army during the Korean conflict from 1950-1952. Eventually he married on 9 June 1956 to Esther Saenz. [Esther was born on 20 July 1932 in Los Angeles.] The couple had at least one child. Stephanie Anne Ritter was born on 12 November 1957. John Gilbert Claybourn was born on 8 January 1909 in the city of Cristobal, which is in the Panama Canal Zone. John graduated from Montebello High School but died at the age of 21 on 16 March 1930 in Montebello, California. He is buried at the Rose Hills Cemetery in Whittier, California. William Harrah Claybourn was born on 27 March 1910 in the city of Gatun, which is in the Panama Canal Zone. However, William died one day later and is buried at the Rose Hills Cemetery in Whittier, California. Jimmie Verne Claybourn (a girl) was born on 30 May 1912 in Gatun, a city in the Panama Canal Zone. She graduated from Montebello High School and would go on to work as a secretary at a law firm. 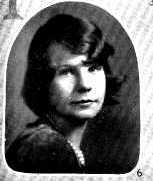 She married on 24 January 1932 to Leonard Martz Stanfield and resided in Whittier, California. [Leonard was born on 11 February 1911 in Rivera, California.] Together they had three children, listed below, and were active in the Whittier Methodist Church. Leonard was in the business of raising citrus fruit with his father but would go on to work as district manager of the Southern Counties Gas Company. The couple lived for a time at 8525 South California Avenue in Whittier, California. Leonard died on 20 April 1970 in Tulare County, California. Four years after Leonard’s death, Jimmie married (2nd) David E. Alldrich on 5 April 1974 in Nairobi, Africa. [David Edward Aldrich was born on 2 May 1906 in Christian County, Illinois. He married (1st) on 26 June 1937 in Dallas County, Iowa, to Elizabeth Marie Chandler (born on 5 March 1912). She died near Mombasa, Kenya, on 4 December 1972 where her husband was working for the Peace Corps.] The following year, Jimmie and David returned to Whittier, eventually moved to Redding, California, and finally settled in Visalia, where David died on 3 July 1991. Jimmie died years later on 7 April 2010 in Visalia, California. At her death she was survived by three children, nine grandchildren, fourteen great-grandchildren, and four great-great-grandchildren. Jimmie and Leonard and Elizabeth and David are all buried in Rose Hills Memorial Park Cemetery in Whittier, California. David Leonard Stanfield was born on 7 March 1933 in Whittier, California. He graduated from Whittier High School and attended Whittier College. David married on 3 January 1951 to Shirley Ann Anderson of Iowa and they had three children, listed below. [Shirley Anderson was born on 24 July 1934.] David and Shirley divorced on 19 September 1958. David married (2nd) Barbara Jeann Fredricksen on 14 May 1966. [Barbara Fredricksen was born on 11 November 1932 in England.] David married (3rd) Lu Hatton on 23 June 1994. [Lu Hatton was born on 5 April 1933.] David died on 16 October 2013 in Colorado Springs, Colorado. David Leonard Stanfield, Jr. was born on 17 October 1951. He married a woman named Dianne had at least one child, listed below. Christina Lea Stanfield was born on 19 September 1979. She had a daughter, Shayna Skye Tafoya-Stanfield, born on 16 September 2005. Deborah Lee Stanfield was born on 28 August 1953. Deborah married James Charles Boeckx on 10 January 1973. [James Boeckx was born on 2 March 1948.] Deborah and James had three children, listed below. Kimberly Lynn Boeckx was born 1 March 1974. Kim married Christopher Douglas Roelfson on 21 December 1991. [Christopher Roelfson was born on 14 June 1974.] They had three children: (i) Alex Michael Roelfson, born on 4 February 1991, (ii) Abigail Lee Roelfson, born on 8 February 1994, and (iii) Aaron Ezekiel Roelfson, born on 19 January 1998. Keri Ann Boeckx was born on 2 September 1976. She married Robert Scott Karl on 10 May 1997. [Robert Karl was born on 2 April 1967.] They had four children: (i) Samuel Nathan Karl, born on 21 March 1998, (ii) Chloe Ann Karl, born on 18 June 1999, (iii) Nicholas James Karl, born on 1 August 2002, and (iv) Benjamin Timothy Karl, born on 4 August 2004. James “Christopher” Boeckx was born on 19 May 1985 in Littleton, Colorado. Stephen Eric Stanfield was born on 22 March 1955. He had one child, listed below. Savanna Lace Stanfield was born on 11 July 1988. Gerald Marvin Stanfield was born on 16 December 1935 in Whittier, California. He graduated with a B.A. from Whittier College and went on to study law at the University of Southern California, thereafter passing the bar exam. He married on 19 Aug. 1955 to Ann Louise Miller. [Ann Miller was born on 8 September 1934.] She graduated from Whittier College with a bachelor of arts and taught domestic science at Whittier High School. Gerald had two children by Ann, Gregory and Douglas, listed below. Gerald and Ann divorced and Gerald married (2nd) Betty Irene Pollinger. [Betty Pollinger was born on 30 July 1943.] Following this second marriage, Gerald married (3rd) Janet Louise Sletvold on 27 October 1991. [Janet Sletvold was born on 1 January 1954.] They had one child, Eric, listed below. Gregory Miller Stanfield was born on 31 October 1957. Greg received his bachelor of arts degree from the University of Redlands and his law degree from Western State College of Law in Fullerton, California. He practiced law as a partner with the law firm of Hanna, Brophy, MacLean, McAleer, & Jensen, LLP. Gregory married Terri Lynn Davis on 13 January 1990. [Terri Davis was born on 16 February 1958.] They had two children, listed below. Kyle Davis Stanfield was born on 30 August 1990. Lauren Rose Stanfield was born on 1 December 1993. Douglas Allen Stanfield was born on 18 April 1962 and had one child, Lucas, listed below. Lucas Claybourn Stanfield was born on 25 August 2000. Eric Gerald Stanfield was born on 20 May 1992. Pamela Louise Stanfield (called “Dixie”) was born on 20 February 1938 and graduated from the University of Redlands in Redlands, California. [Some information on Pamela and her family was confirmed and/or corrected by Pamela in correspondence between Pamela and Joshua A. Claybourn in April of 2009.] She received a bachelor of arts in liberal arts and went on to teach. Just before turning twenty-one she married on 1 February 1959 to Robert Rolstin Link of Visalia, California. [Robert Link was born on 1 July 1937.] He obtained a degree from the University of Redlands in 1959 in business administration. Robert worked in a men’s clothing store in Visalia. Together Pam and Robert had three children, listed below. Jeffery Norman Link was born on 30 May 1960. He married Valerie Kay Condra on 8 Aug. 1992. [Valerie Condra was born on 6 January 1967.] They had two children, listed below. Emily Michelle Link was born on 26 June 1997. Kaitlyn Elizabeth Link was born on 23 March 2001. Terry Marie Link was born on 27 December 1961. She married Paul Michael Geiger on 28 January 1988. [Paul Geiger was born on 3 February 1960.] They had two children, listed below. Michael Robert Geiger was born on 9 September 1989. Alex Paul Geiger was born on 31 July 1991. Leslie Marie Link was born on 4 February 1966. She married Darrin Lee Cantrell on 3 June 1994. [Darrin Cantrell was born on 29 June 1969.] They had two children, listed below. Parker Leonard Cantrell was born on 30 October 1998. Abigail Louise Cantrell was born on 17 January 2001. Robert Maury Claybourn was born on 11 February 1918 in Ancon, a city in the Panama Canal Zone. He married (1st) on 21 June 1940 to Elta Bettie Jamieson. [Elta Jamieson was born on 28 August 1918.] They divorced, but had one child, Sharon, listed below. Robert married (2nd) on 12 November 1948 to Lola Aileen (Richey) Rhoads. [Lola Aileen (Richey) Rhoads was born on 25 January 1911 and died on 14 February 2003.] They divorced and Bob married (3rd) to Adele Bengela on 17 May 1968. Bob’s occupation for much of his life was in the printing business. He died on 2 February 1973. Sharron Dian Claybourn [as spelled on her birth record] was born on 4 May 1941. She attended college in Santa Barbara, California. She married Denis De Zonia and together they had three children, listed below. Cynthia Leane De Zonia was born on 16 October 1961. John Paul De Zonia was born on 2 May 1971.